Property managers and business owners have very full agendas. There are many components that need attention when overseeing multiple properties, managing factories, or keeping your storefront running. Wouldn’t it be nice if there was an efficient, reliable way to make sure your fire protection equipment was code-compliant and properly prepared in the event of an emergency? A certified BuildingReports provider will send a technician to set up your buildings on the system. This involves placing bar codes on your safety equipment, as seen to the right. Each item will have a unique code. 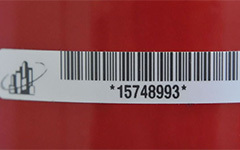 As the bar codes are placed, the technician will also enter them into your unique database by scanning them using a palm pilot or cellular device. It is best to incorporate this with your annual fire extinguisher inspection, as each extinguisher will need to be inspected before being entered into the system. Details about the extinguisher, including its age and condition, are including in the reports filed in your database. This database is also created by the technician. An account will be created for your business, with each building having its own section. The login information will be shared with you, and after the technician has completed the installation and inspection of your equipment, his findings will populate your database with all the information you need to be sure your property is protected. After set up and installation is complete, you will want to discuss the frequency of future inspections with your fire protection company. Due to code requirements or safety concerns, many large properties will schedule monthly inspections to ensure their equipment remains compliant. You will reach an agreement with the fire protection company concerning your inspection schedule and the associated costs. After that, you will be able to sit back and allow your fire protection provider to do the work for you. On each repeat visit, your equipment will be re-scanned and reports created with any important information about that day’s inspections. The information collected by the fire protection technician will be uploaded into your individual BuildingReports database. Your fire protection provider will have a place on their website where you can go to access this database (ours can be found at the bottom right-hand corner of our home page). Using the login information provided, you will be able to view the results of your inspections, verify that every piece of equipment was checked, and print the reports for your records. There will also be notifications when maintenance on the equipment is going to be due, such as a six-year inspection of your fire extinguisher. As these periodic maintenance requirements cost more than your routine inspections, being able to know ahead of time how many of your extinguishers will be requiring maintenance can help you budget accordingly. The limitless potential and ways that this technology can help your business are fully demonstrated in this case study conducted by BuildingReports, demonstrating Pye-Barker’s effective use of this technology to deliver peace of mind to Shaw Industries Group, Inc., the largest flooring manufacturer in the world. Still have questions? Visit our website for more information and to have a representative visit your site and help explain how BuildingReports would be the right solution for your business safety needs.